Extra training sessions, weeks and months away from his family and ditching eating burgers. 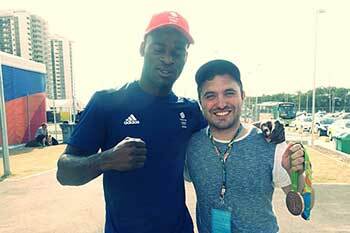 British light-heavyweight boxer Joshua Buatsi has made sure he has worked hard for this moment. The 23-year-old from Croydon, south London, who is also finishing his sports science degree at St Mary’s University, received his Olympic bronze medal on Thursday. A remarkable feat considering he was unseeded before the Games began. Amongst all the hype and amongst all the excitement, you would forgive Joshua Buatsi to have his head in the clouds. Instead Buatsi was eager to reflect and thank all those who had played a part in his journey so far. From friends and family, to his coaches and those at his church in London. It was refreshing to hear an athlete speak so openly and honestly about his faith, especially in the context of the boxing world which brings about its own pressures. Reading the Bible before he goes into the ring is one example of how he intertwines his faith with his sport. A decision is yet to be made on his future, whether or not to make the jump into the professional boxing world. It is clear this is something that will not be rushed. Some people like to forget their roots, to move on to pastures new and let the past be the past. Buatsi though, who grew up on the Shrublands estate, in south London, and was coached at his local South Norwood and Victory boxing club, is already looking forward to inspiring the next generation. He has already planned to visit the South Norwood gym and hand out some Team GB t-shirts to the kids at the club, as well as talking to them about his long journey to Olympic glory. For those of us who are not elite athletes it is hard to understand the dedication it takes to reach the top echelons of sport. Buatsi sacrificed spending time with friends and family so he could fit in extra training at Team GB’s base in Sheffield. He even apologised in his interview, saying one of the first things he was going to do was spend some time with those closest to him. The future is obviously very exciting for Joshua Buatsi, and with his feet firmly on the ground, this bronze medal could be the start of another enthralling journey for the south London boxer. Head for http://www.passionforsport.com/blog/2016/8/20/boxer-joshua-buatsi-reflects-on-olympic-bronze to hear the full interview.